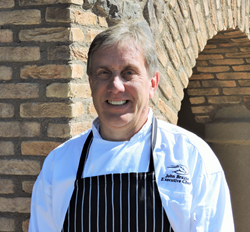 Executive Chef, John Brazie, joins the Flying Horse culinary team in Colorado Springs. Brazie will oversee private dining at The Club and public dining menus at The Steakhouse. Foodies and culinary aficionados are delighted with Executive Chef, John Brazie's, leadership at The Club and Steakhouse at Flying Horse. Flying Horse Country Club and Steakhouse Name New Executive Chef. Flying Horse recently named John Brazie Executive Chef for The Club and The Steakhouse at Flying Horse, including The Club’s private dining, corporate events, and weddings. Brazie will also lead the culinary efforts at The Steakhouse at Flying Horse, which is open to members and the public. "John is an exceptionally talented and acclaimed Executive Chef from the Houston area. He thrives on providing an outstanding guest experience across all food and beverage offerings." said General Manager, Wendy McHenry. Having spent the last two decades as Executive Chef for the renowned Woodlands Resort, John has world-class exposure with the opening and operating of private clubs, branded hotels and hosting marquis international events. This encompassing experience has created an expansive repertoire and unique talent. His signature of quality is most proudly experienced in Robard's Steakhouse, TripAdvisors #1 rated restaurant for that region. Brazie's inspiration for cooking was his father, Richard, who he spent countless hours with in their New England kitchen. John's understanding of the nobility and importance of a chef can be attributed to the combination of a life of experience and a French mentor, who had a huge impact on him. His personal creed is to be relevant, to contribute to the evolution of cuisine and to develop the chefs who are next in line. His philosophy is that "great food is recognizable and appropriate to its environment. A dining experience should be authentic and truthful, while allowing nature and skills to play the starring role".